UMC/Island/InterscopeRemastered versions of three U2 albums released during the 1990s will be released on vinyl on July 27. 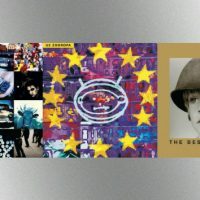 1991’s Achtung Baby, 1993’s Zooropa and the 1998 compilation The Best of 1980-1990 will be available as two-LP sets pressed on 180-gram vinyl. All three reissues feature artwork either replicating or based on that appearing on the original releases, and come with a download card offering access to digital versions of the albums. Achtung Baby, U2’s seventh studio album, topped the Billboard 200 chart and featured four top 40 hits: “Mysterious Ways,” “One,” “Even Better than the Real Thing” and “Who’s Gonna Ride Your Wild Horses.” The record has sold more than eight million copies in the U.S. The Best of 1980-1990 features various hits and other gems U2 released during its first full decade of existence. The compilation peaked at #2 on the Billboard 200, and has gone on to sell more than 4 million copies in the States. All three vinyl sets are available for pre-order now at U2’s official online store and are priced at $38.99.